French President Emmanuel Macron told delegates at a finance-themed climate summit in Paris "we are not moving fast enough"
Paris (AFP) - Major investors vowed Tuesday to move away from Earth-warming fossil fuels as world leaders met in Paris seeking to unlock new cash to save humanity from climate "doom". Two years to the day since 195 nations sealed the Paris Agreement to avert worst-case climate change, banks and companies announced billions of dollars of intended divestments from coal, oil and natural gas at a finance-themed climate summit. But conference host France, as well as the UN and the World Bank, said efforts to shift the global economy into a green energy future were too little and too slow, as a report warned about unprecedented Arctic warming. 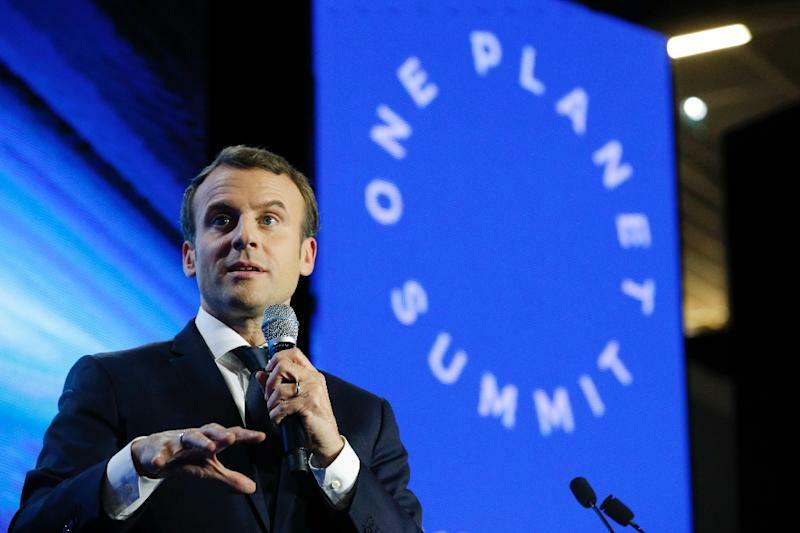 "We are losing the battle" against climate change, French President Emmanuel Macron told delegates. "We are not moving fast enough." For his part, UN Secretary-General Antonio Guterres said continued fossil-fuel subsidies amounted to humanity "investing in its own doom". "We are in a war for the very existence of life on our planet as we know it," Guterres told more than 50 heads of state including Mexico's Enrique Pena Nieto, Britain's Theresa May and Spain's Mariano Rajoy, at the summit called by Macron. The US National Oceanic and Atmospheric Administration (NOAA) said Arctic warming -- which is happening at twice the planetary rate -- was the "new normal", and would have global consequences. "The Arctic has traditionally been the refrigerator of the planet," said Jeremy Mathis, director of NOAA's Arctic Research Program. "But the door to that refrigerator has been left open." The Paris Agreement, which took more than two decades to negotiate, seeks to limit average global warming to under two degrees Celsius (3.6 degrees Fahrenheit) over pre-Industrial Revolution levels. Under it, countries have pledged nonbinding cuts in greenhouse gas emissions from the burning of oil, coal and natural gas. US President Donald Trump has called climate change a "hoax", rejecting the Paris deal and vowing to restore jobs in the fossil-fuel industry. World Bank president Jim Yong Kim announced to loud applause Tuesday that the lender would "no longer finance upstream oil and gas after 2019" in a move hailed by Greenpeace as a "damning vote of no confidence to the future of the fossil fuel industry". French insurer Axa, meanwhile, said it would speed up its divestments from the carbon sector, pulling 2.5 billion euros ($2.9 billion) from companies which derive more than 30 percent of their revenues from coal. And a group of more than 200 global investors launched a campaign to pressure the world's largest corporate carbon emitters -- including BP, Airbus, Volkswagen and Glencore -- to go greener. According to the International Energy Agency, green energy investments of about $3.5 trillion per year will be needed for the world to stay under the Paris accord's two-degree limit, an amount double current spending. On current emissions trends, the world is on course for warming of three degrees Celsius, experts warn, with life- and asset-threatening superstorms, sea-level rise, floods and droughts the result. Trump came under fire from all quarters on Tuesday. His rejection of the Paris pact was "politically short-sighted and misguided, economically irresponsible, and scientifically wrong," said former UN chief Ban Ki-moon. But American businesses, regions and local government leaders have pushed on with climate efforts regardless of the federal government. 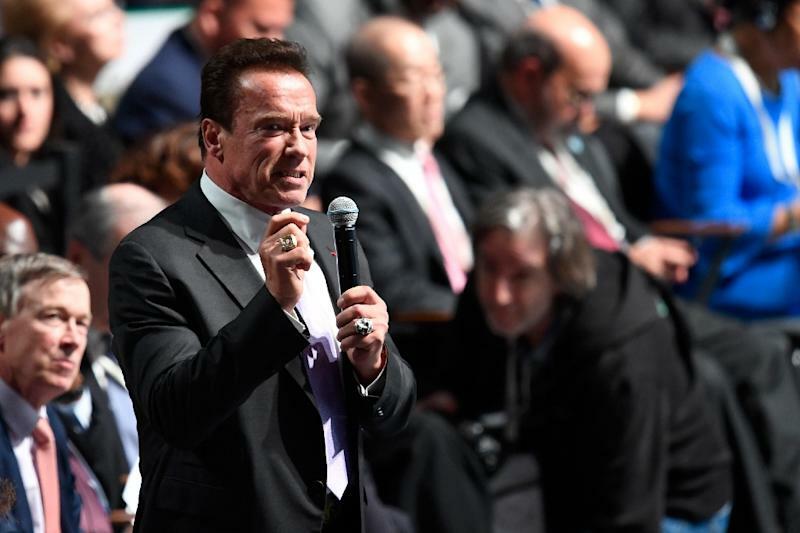 "It doesn't matter that Donald Trump backed out of the Paris Agreement," said former California governor Arnold Schwarzenegger, the face of the R20 network of regional climate actors. "We at the subnational level, we're going to pick up the slack." 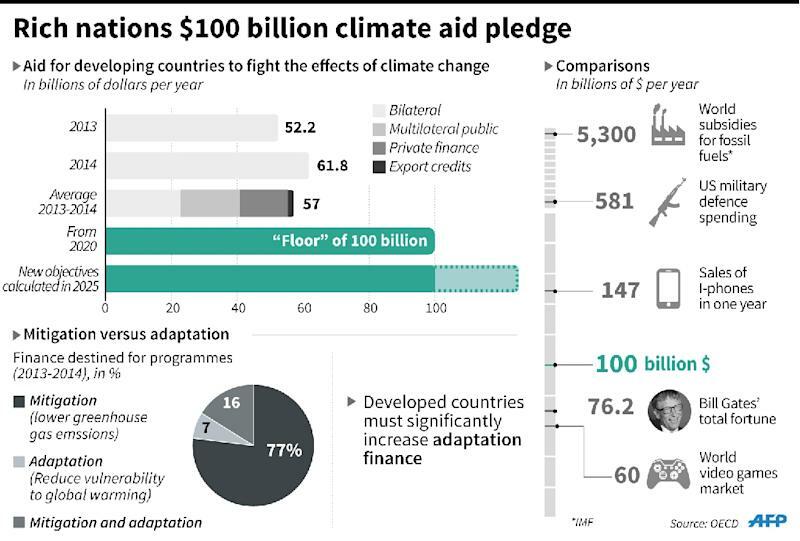 Still, many remain concerned about climate financing for developing countries, of which the US -- the world's biggest historical greenhouse gas polluter -- has traditionally been a major contributor. Trump has vowed to slash climate finance and withhold $2 billion pledged to the Green Climate Fund. Developing nations need the money to ease the costly shift away from fossil fuels and to shore up defences against weather disasters induced by climate change. Rich nations, who have polluted more for longer, pledged in 2009 to muster $100 billion per year in climate finance from 2020. On 2015 trends, total public financing would reach about $67 billion by that date, according to a report of the Organisation for Economic Cooperation and Development (OECD). Climate activists welcomed the outcome of Tuesday's summit, though many said they had hoped for more funding announcements and a clear commitment from governments to stop financing fossil fuels. The meeting showed that "countries, states, cities, businesses and civil society are firmly committed to their Paris commitments and are coming good on their promises, with or without the US," said Mohamed Adow of Christian Aid, which represents the interests of developing nations at the talks. Macron called for a yearly gathering to take stock of progress. "We started today to make ground on the battle field," he said. "I hope that in the coming weeks and months we can accelerate."